June issue on sale today! | What Hi-Fi? Our June issue goes on sale today, including a 12-page special with reviews of brand-new sets from Samsung, Pioneer, LG, Philips and more. 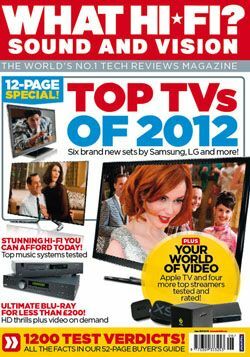 We've even got a full review of the world's first glasses-free 3D TV from Toshiba, as well as the replacement for last year's TV Product of the Year, the Panasonic TX-P42GT50. And we take a first look at Philips's super-widescreen 21:9 ratio 50in LED TV, plus Panasonic's first passive 3D TV. Of course there's much more to what we do than just tellies, so we've got exclusive First Tests of Arcam's impressive rPAC DAC + headphone amp, Cambridge Audio's dinky Minx S215 speaker package, the HTC One X smartphone, the Motorola Xoom 2 ME tablet, Canton's your-Duo wireless speakers and the entry-level Cambridge Audio DacMagic 100. Hi-fi enthusiasts are in for a particular treat this month too: our Supertest focuses on one-make hi-fi separates systems from the likes of Arcam, Cyrus, Rega and Roksan (CD player and amp) from £1000 to £1500. And we've even built a trio of top-notch stereo systems by mixing and matching components from different companies. The Big Question this month asks: "Is upgrading your DAC the key to improving your PC's sound?" Three readers decide. Elsewhere in the issue we look at next-gen Blu-ray players for less than £200, one-box video streamers and 11.1 surround sound. The icing on the cake is the chance to win a set of Monitor Audio RX6 AV12 speakers worth £2820 in this month's competition. And don't forget you can download the digital edition of the magazine to your PC, Mac or iPad through Apple Newstand.